The AFA Racing Team recently went to competition in Michigan with the car they'd been building this semester. But before the Cadets left for their Competition, we were able to catch them out doing their dry run with the car! 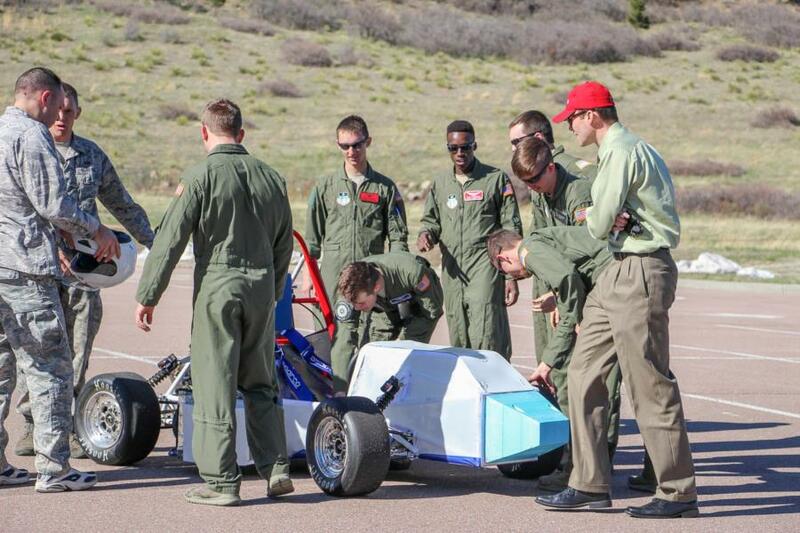 The car that the Racing Team built this semester used dynamic testing to test the car’s capabilities and reliability. They'd been having a problem with the wheel hub failing, causing the wheels to fall off. Since the part was manufactured in house, they chose a different material, and remanufactured them, causing the problem to go away. The Racing Team has also been using dynamic driving to build an engine tune when the car is under load. The car is designed in-house, with about 50-60% built by cadets, with assistance of the lab technicians. Parts such as the motor, rims, electronics, and brake systems are purchased to allow more time for development of other parts, but each system does have custom parts. For instance, on the motor, all fluid tanks and air intakes are made in house. The rims are custom made for them, using the dimensions that they give the company. Brake rotors and routing are done by cadets, and the electronic components are assembled into a custom harness. The team finished 94th overall, with their highlights being 34th in presentation, 69th in skidpad, and 78th in Autocross. To view the rest of the pictures taken during their test run, go to Galleries - Extracurricular - Cadet Clubs. Or click the link below.